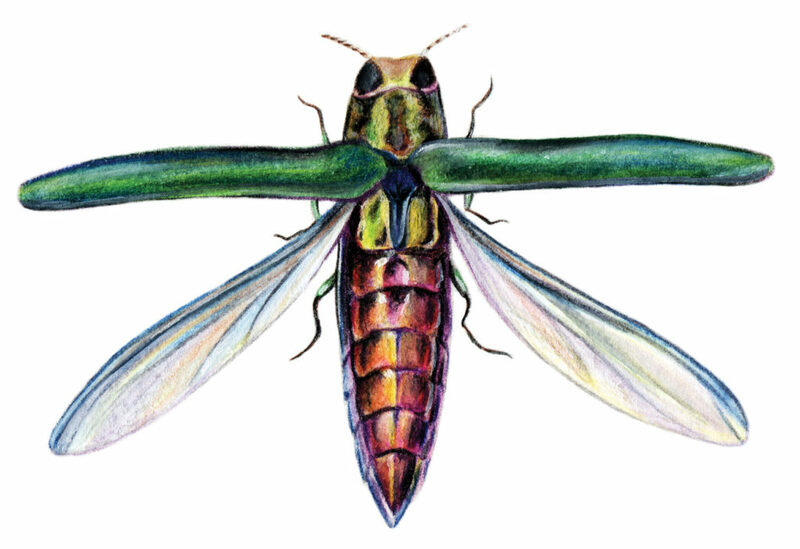 Emerald ash borer (EAB) is an invasive pest from Asia and threatens the ash tree population in the United States. In Michigan alone it has killed over 20 million trees since its discovery in 2002. Through a combination of natural spread and human activity it is now found in 22 states, placing millions of additional ash trees at risk. It will continue to spread and is probably a permanent member of our insect population. The adult insect lives on the outside of ash trees feeding on the leaves during the summer months and then lays its eggs under the bark of ash trees in early fall. The larvae over winter in the cambium layer of the trees feeding on the carbohydrates the tree stores for energy. The trees are killed by the tunneling activity of the larvae under the tree’s bark, which disrupts the vascular flow and girdles the tree. 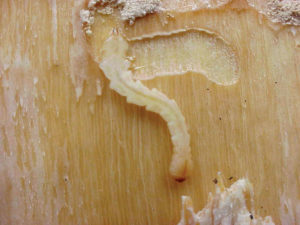 The Emerald Ash Borer has predominantly targeted green, black, and white ash in the US, although in Asia other types of ash have also been infested. Ash do not have natural defenses to the Emerald Ash Borer, and trees of all sizes and conditions have been killed. 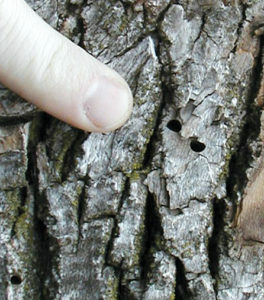 Adult beetles cause relatively little damage, but the larvae feed on the xylem layer and disrupt the movement of water and minerals within the tree. Early symptoms can be difficult to diagnose, but eventually the canopy dies from the top down. Trees may be infested for several years before symptoms are visible in the canopy. Insecticide treatment is the only option to preserve the ash tree species from this aggressive insect. EAB management is not a one size fits all process. Let the ISA Certified Arborists at Stevenson Tree Care assist you with the identification of saveable trees and determining the best management processes for your trees. Current insecticide technology, Xytect, can protect your tree from EAB and other insects with one soil treatment. With Xytect your tree will have year long protection. Trees that are already infested with EAB may be treated with ArborMectin using a tree injection method. ArborMectin can be effective for multiple years. Success is ultimately determined by both tree condition and treating the tree before it is challenged by Emerald Ash Borer. Ash trees located within 20 miles of the nearest EAB infestation should be treated preventively. However, because symptoms from EAB can be difficult to identify, high value trees greater than 20 miles should be considered for treatment as well. 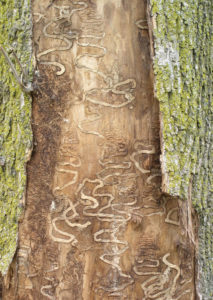 If your Ash tree is important to you, healthy enough for treatment and does not have a visible symptoms of infestation, protecting it from Emerald Ash Borer is both affordable and effective. 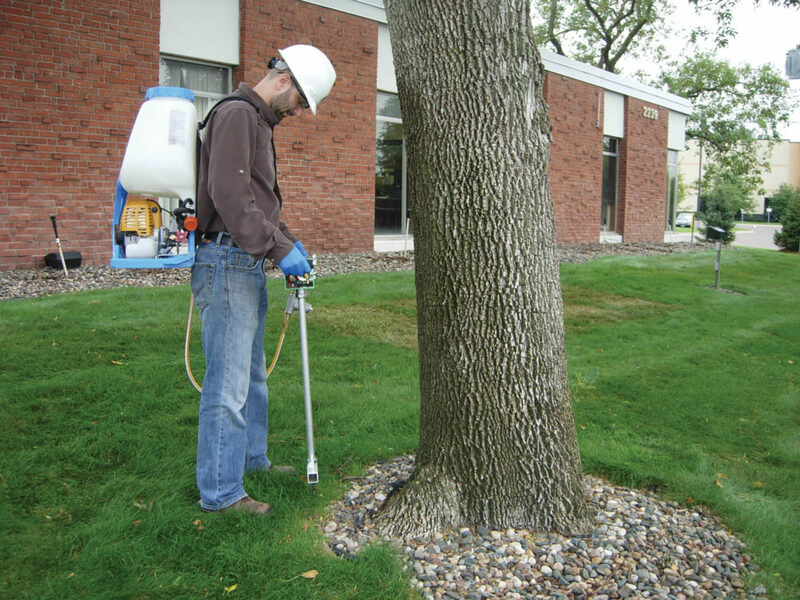 Properly applied systemic insecticides provide an effective and consistent way to protect your trees from EAB. 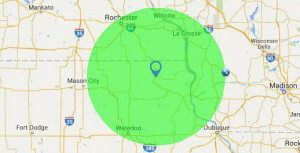 We offer EAB management options for residents in Decorah, IA and surrounding communities. Tree health evaluation – Is the tree structurally sound and healthy enough to treat? Tree benefit evaluation – Do the benefits associated with the tree outweigh the cost of treatment? EAB symptom evaluation – Inspect the tree for symptoms of EAB. Currently infested trees require a higher dose of insecticide to successfully save the tree. Determine the best treatment option for the tree – Using the information gained in the tree evaluation we will determine the best treatment option for your tree and landscape. Xytect is a systemic insecticide that protects the vascular system of the tree. Xytect applied to the soil at the base of the tree is evenly distributed throughout the canopy by the pull created by the leaves. When the insect ingests Xytect they quickly stop feeding and die. The tree’s vascular system translocates the treatments up to the canopy. Xytect can be applied in a variety of ways, most commonly by a basal drench or by soil injection. For trees with active borers or an immediate threat, a one time tree injection is the fastest way to get control. This is done into the root flares of the tree. If you have a tree that is infested, or a large tree that is in a high risk area your arborist may recommend a treatment using ArborMectin. ArborMectin is applied by injecting it into the root flares of the tree and has been shown in University trials to get excellent control of actively feed EAB larvae. ArborMectin works for multiple seasons. Soil application provides protection for your trees. Treat important trees first: specimen trees, trees shading your home, patio trees, etc. These trees should be healthy and vigorous. Research trials have shown systemic insecticide treatments are highly effective at protecting ash trees. Preventively treating your tree is the best defense against EAB. If the state starts doing eradication cutting and the tree you have been treating falls within the eradication area, the state will remove your tree even if the tree is healthy and free of EAB. Once treatments begin, you will need to treat your tree yearly to maintain protection.